The descriptive statistics view provides a tabular summary of the descriptive statistics for all metrics. Each row of the table represents one design metric, the columns provide the descriptive statistics (minimum, maximum, mean, standard deviation, and several percentiles). 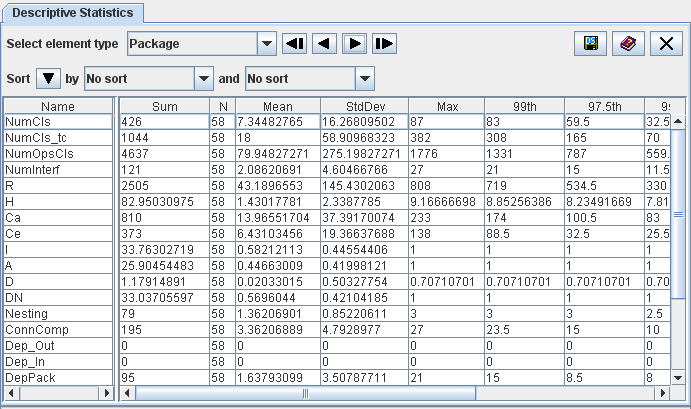 The context menu of the table links to the histogram view for the selected metric (Section 4.5 "The View 'Histograms'"), and its full definition in the measurement catalog view (Section 4.13 "The View 'Catalog'"). Section 4.7.2 "Accepting Design Rule Violations" Contents Section 4.9 "The View 'Design Comparison'"